The story focuses around a game called– you guessed it– Book Scavenger. The fabulous thing is– you can actually play the game in real life! 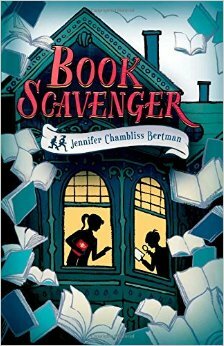 Book Scavenger is found on the new book spinner! The TA Library will be hiding books regularly as long as students keep finding them. It would be great if you hid books, too. They don’t have to just be at TA, either. Follow the lead of the characters and get creative! TA Library would love to share photos of your creative hiding places, cool secret codes or book finding triumphs! You can find everything you need at bookscavenger.com. A list of the latest books hidden is here. Code & Cipher Book in the Library! Just like the library in the book, TA Library will be putting our book about secret codes and ciphers on RESERVE. This means it has to stay in the library so everyone can use it. Ask the librarian where you can find it.